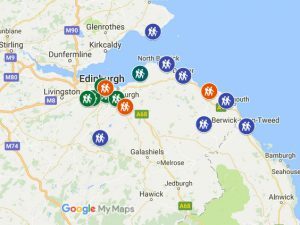 Our bumper Excursion Programme for 2018 allows you to experience the superb range of geology that southern Scotland has to offer. 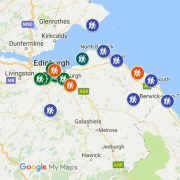 Explore the building stones of Perth, find some amazing fossils, find out about the glacial history of the River Tweed area … or go on an evening excursion to a local hill and explore the historical links between landscape, resources and people. Excursions are booking fast, and some are now full with a waiting list. Book now! 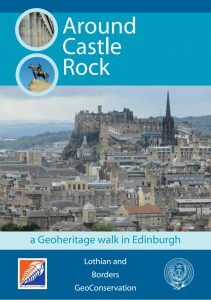 Lothian and Borders GeoConservation have launched their latest leaflet, Around Castle Rock, written by Andrew McMillan and available in printed format and as a free download from this website. Edinburgh Castle Rock developed as part of a volcano hundreds of millions of years before human occupation. Today it provides a spectacular backdrop to the centre of the City of Edinburgh. 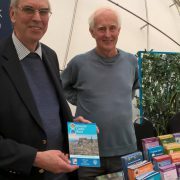 This booklet describes the geological processes which created the landscape of the city centre and a selection of stone-constructed buildings and monuments which form part of the city’s built heritage. 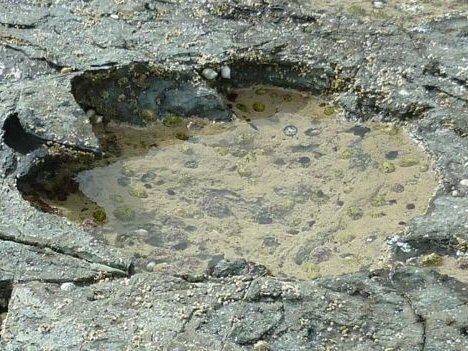 A new article in the Scottish Journal of Geology (the academic journal published jointly by the Edinburgh and Glasgow Geological Societies) describes important new dinosaur tracksite at Rubha nam Brathairean (Brothers’ Point) on the Isle of Skye. Most of the prints were made by long-necked sauropods – which stood up to 2m (6.5ft) tall – and by theropods. 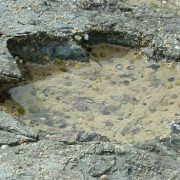 Researchers measured, photographed and analysed about 50 footprints in a tidal area at Rubha nam Brathairean on the Trotternish peninsula. Analysis of the clearest prints enabled scientists to ascribe them to sauropods and theropods. You can access the full article from the Scottish Journal of Geology website here, currently available as a free pdf download.